Japanese guitarist Kazuhito Yamashita has been compared to a one-man band. He doesn't play more than one instrument at a time, and he doesn't strap drums and cymbals to his back, but he has managed to do the seemingly impossible: successfully arrange full-scale symphonic music for the classical guitar. Mussorgsky's Pictures at an Exhibition, Stravinsky's Firebird Suite, and even Dvorak's "New World" Symphony have been put through Yamashita's musical strainer to emerge as absurdly difficult, yet extremely compelling items for solo guitar. Yamashita is, however, not a gimmick-artist: his real musical home is in the standard guitar repertoire, which he plays with a technical skill and stylistic assuredness that have few equals in the guitar world. Kazuhito Yamashita was born in 1961 in the city of Nagasaki. In 1976 he won the All-Japan Guitar Competition, and in 1977 he took the top prizes of the Ramirez Competition in Spain, the Alessandria competition in Italy, and the Concours International de Guitare in Paris. He was, understandably, the talk of the musical town, and successful concert appearances in the world's musical capitals soon followed. He has a special affinity for the (plentiful) guitar music of Fernando Sor, the full body of which he has recorded. His arrangements of non-guitar works for solo guitar have not always earned him the love of the musical establishment: performances of such transcriptions as the above orchestral items usually go hand-in-hand with a certain amount of controversy, and the debate about the merit of such over-the-top — some would call it garish — display continues unabated. Yamashita has not involved himself much in the debate, however, and he continues to prove himself one of the most fascinating performers of his day. — Blair Johnston. 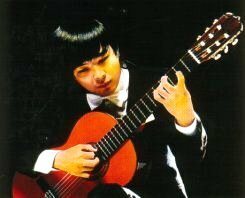 One of Japan's greatest classical guitarists, Kazuhito Yamashita made his recorded debut in 1978 with Romance de Amor. In the years to follow, he remained a prolific artist, releasing albums including 1980's Kazuhito Yamashita Plays Bach, a 1982 recording of Beethoven's Concerto in D, and 1985's Scheherazade. — Jason Ankeny. Born in Nagasaki in 1961, Kazuhito Yamashita has been acknowledged as the world's most virtuoso guitarist by critics and public alike, who are fascinated with his dazzling technique and expressive talent. His almost 75 recordings and numerous original arrangements of such works as Mussorgski's Pictures at an Exhibition, Stravinsky's Firebird, Rimski-Korsakov's Scherezade and Dvorak's Symphony of the New World have become a legend within guitar circles. In 1978 Yamashita made his debut in Japan and one year later he made his European debut in Paris, where he was acknowledged as the greatest revelation of the guitar. Still in his twenties, he made his first appearances in Canada (Toronto Guitar Festival), America and England. He gave a solo recital in the Musikverein (Grand hall) in Vienna. In 1989 the Casals Theatre in Tokyo, the most prestigious Japanese theatre, presented a series called The World of Kazuhito Yamashita, made up of seven concerts in 12 months. The peak of the series was Castelnuovo-Tedesco' 24 Caprichos de Goya in one performance. It concluded with Bach's six sonatas and partitas in two consecutive nights. He also had his recital series in 1994 and 1999. In addition to his solo performances, he also plays in duo, as well as with chamber music ensembles, orchestras and internationally acclaimed artists, such as Leonard Slatkin of the London Philharmonic Orchestra, NHK Symphony Orchestra, Rafael Fruhbeck de Burgos, Los Angeles Chamber Orchestra, Orquesta de la RTVE, James Galway (flute), Michala Petri (recorder), The Tokyo String Quartet and Gary Karr (double bass). In the 4th Santo Tirso International Guitar Festival, held in 1997, he played 4 concertos in one night with the Cordoba orchestra, conducted by Leo Brouwer. He has recently been invited by Claudio Scimone to play with I Solisti Veneti in Italy. Kazuhito Yamashita has recorded for BMG (RCA), Crown Classics, Japan Victor, King Records and Alfa Records. His recordings include 16 CDs with the complete works of Fernando Sor (Japan Victor), and a collection of 5 CDs containing J. S. Bach's sonatas and partitas for violin, cello, lute and flute (BWV995-1013), which he himself transcribed for the guitar (Crown Classics). The recording of Mussorgski's Pictures at an Exhibition, released in 1981, was awarded the prestigious Deutsches Grammophon Award. He started to study the guitar at the age of eight with his father, Toru Yamashita. In 1972, aged eleven, he won the Kyushu Guitar Competition. Four years later, he was awarded the first prize in the All Japan Guitar Competition. In1977 he won three important international competitions - the Ramirez in Spain, the Alessandria in Italy and Paris Radio France Competition, being the youngest winner ever recorded. Yamashita has given solo recitals in concert halls around the world such as Vienna's Musikverein Grosser Saal and the Lincoln Centre and has performed with a variety of orchestras and conductors in Europe, North America and Asia. His sensational appearance at the Toronto International Guitar Festival in 1984 was particularly memorable. He is an enthusiastic proponent of new works for the guitar and has given world premiers of new compositions around the world, in particular the works of the Japanese composer Keiko Fujiie. In 1999, he received the National Arts Festival Grand Prize by the Japanese Government's Agency for Cultural Affairs for his CD recording 'Japanese Guitar Music 1923-1948'.